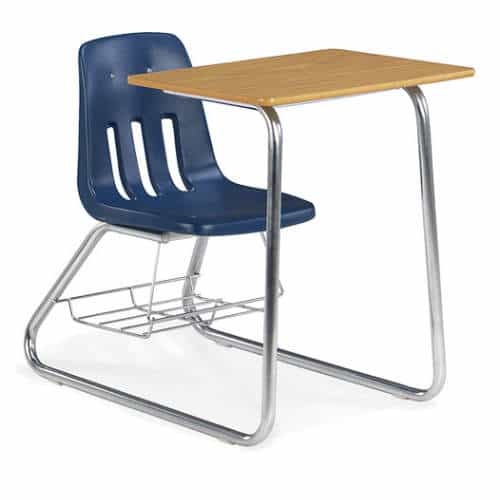 The Virco 9640BR Sled-Base Student Combo Desk gives you sled-base design with double-entry seating. A tied-in arm welded to our tubular steel back support delivers added strength to our sturdy work surface. The 18″x24″ writing surface features a durable high-pressure laminate finish. A welded bookrack and nylon carpet glides are a few features that make this student desk a great choice. This desk is shown with a Navy Blue Seat Shell, Chrome Frame and Medium oak Writing Surface. Please contact us for more finish options. 9640BR Virco Sled-Base Combo Desk with BookRack , tubular steel frame with tablet arm laminated writing surface.